April 10, 2012 -- When Bruton Smith built z-Max Dragway, not far from NASCAR’s Charlotte Motor Speedway, he doubled the number of racing lanes from the traditional two to four. It definitely created a different approach for the straight-line sport. 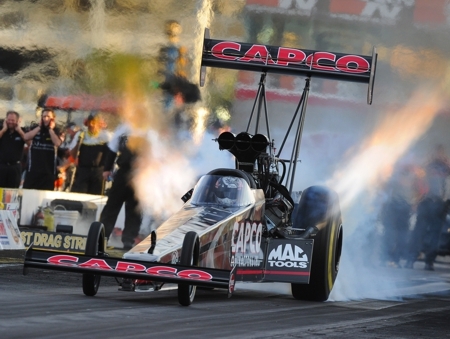 Steve Torrence has embraced it and now, two years later, he’s eagerly anticipating Friday’s first Top Fuel qualifying attempt in the third annual 4-Wide Nationals at zMax Dragway, Friday through Sunday. “Our car really ran well at Las Vegas two weeks ago,” said Torrence, who advanced to the semifinals in the Torrence Racing/Capco Contractors Inc. dragster. “The crew did its job and I drove well. The more we race, the more comfortable I’m getting in the car. I’m also getting more confident as a driver. “We are all excited about the way the car is running and we want to carry that momentum into the 4-Wide race this weekend. He moved from ninth into seventh in Full Throttle Series points after four of 17 races leading to the Countdown to 1 six-race finale. Torrence explained the different starting-line challenges the drivers encounter when they line up with three cars instead of one. He finished second in the first 4-Wide round last year and advanced to the second of three rounds.